Adobe Flash “SWF” Exploit Still In The Wild. A vulnerability reported in Adobe Flash in April 2011 (CVE-2011-0611) continues to be targeted. When first reported, the vulnerability was widely exploited by embedding a “.swf” file into Microsoft Office documents/html pages. Adobe issued patch for this vulnerability soon after it was reported, but the vulnerability remains a popular target. This exploit code embeds a “nb.swf” flash file into a webpage, which is then executed by the Adobe Flash player object initialized using classid “d27cdb6e-ae6d-11cf-96b8-444553540000”. When the page is being loaded, the malicious “nb.swf” file is downloaded from the URL “http://220.181.23.217/baike/nb.swf”. Execution of “nb.swf” leads to memory corruption in Flash Player, which allows execution of arbitrary shellcode, which is passed as an input parameter. 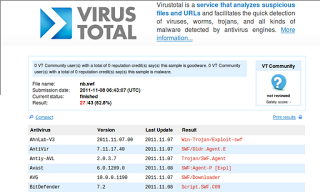 The Virustotal report for “nb.swf” shows it is a Trojan Downloader, used to deliver additional malware to the infected machine. Flash and other browser plugins remain a popular target for attackers, even for known vulnerabilities that have been patched for some time. This is because attackers know that plugins regularly remain unpatched for some time. 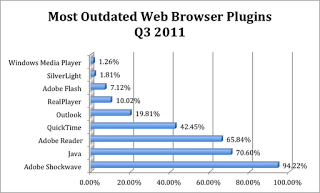 The chart below details the most outdated browser plugins seen by Zscaler during Q3 2011. As can be seen, about 7% of all browsers that we see with Flash Player installed, are running an outdated and potentially vulnerable version of the software. Other plugins present are even more frightening targets. Be sure you update your plugins regularly!